Since the last 2 days, I am getting a message in my SO Inbox with the comment below for my previous answers where I have suggested only a link as the answer. Interestingly these comments are from different users on different answers. Is this is done automatically by Stack Overflow staff, or is that a bug? Those comments come from people who are using the new /review-beta page. 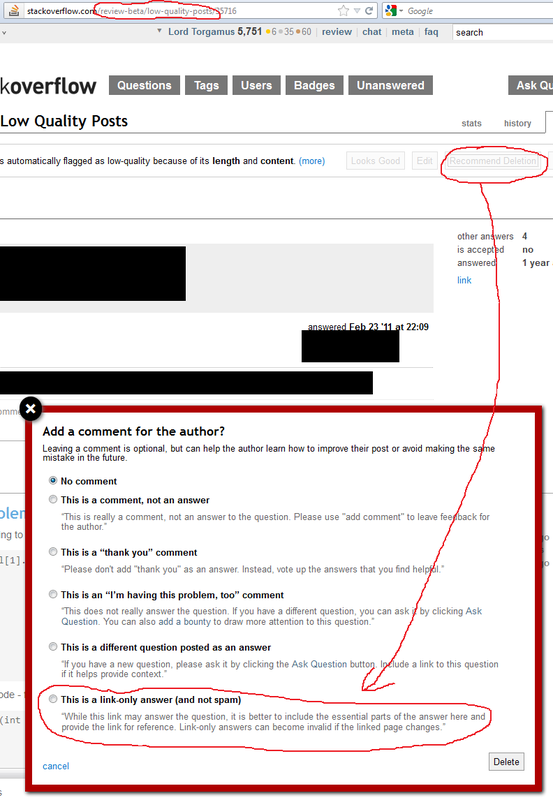 When they review answers from the Low Quality Posts section, one of the buttons they see is Recommend Deletion. Reviewers who recommend deletion get the opportunity to provide a reason. Each reason comes with a boilerplate comment that the system automatically adds to the post in question. Not the answer you're looking for? Browse other questions tagged discussion comments review low-quality-posts link-only-answers . Criticizing an almost three-year-old answer because it's too short? Three individuals have now commented the exact same comment on old answers of mine? New policy on Link-Only Answers? What should I do when a user complains about a canned review comment and refuses to improve their post? Should answers linking to tools or libraries be marked for deletion as link-only? Where to get the link-only text from? Prevent duplicate form comments in review queues?